One thing I’ve found is that if you ask, you will receive. Let family and friends know what you are in need (or want) of. Just by letting our family know that we were willing to take unwanted items off their hands, we’re received tons of items for yard sales; a huge playhouse, picnic table, tricycle, and rocking horse for our daughter; clothes, shoes, furniture, and books. Most of these items were in great or even new condition. The original owners just didn’t want them. For example, my cousin lost some weight and wanted her “fat” clothes out of her sight. I was happy to take them off her hands. We try to pass on the favor by giving things we don’t want or can’t use to others who can. We also sell items very cheaply at our yard sales (like 5 or 10 cent clothes). We may not make a lot of money off them, but I know I’m helping someone else get nice clothes for very little money. 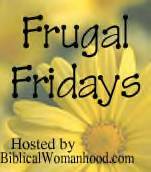 Check out more Frugal Fridays at Biblical Womanhood! Okay, so this might not be the most environmentally friendly thing to do, but I think it is frugal. I actually thought everyone did this. I save plastic grocery bags and use them for little trash can liners, for diaper transportations (I use cloth mostly, but they work for disposables. You don’t have to buy those little diaper trashbags), for taking stuff to a friend’s house, etc. You could also use them for doggie poop bags. A good way to store them is to stuff them down in an old Kleenex box. You can get tons of bags in one and it doesn’t take up much room. More Frugal Friday tips are at Biblical Womanhood!